Wet winter weather, cold days, and colder nights are conducive to enjoying a good potjie (pronounced poy-kie) cooked over open coals. "Potjiekos" is the official term for this traditional meal. 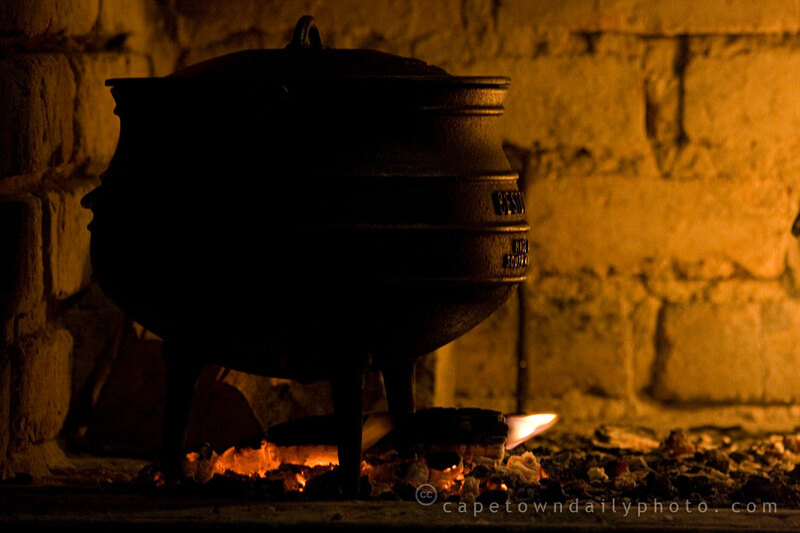 "Potjie" is an Afrikaans word meaning "little pot", interpreted in this context as a cast-iron pot. The idea is that one places the pot over a few coals and adds meat, onion, herbs and spices, letting them simmer until the meat is nicely browned. You can then add vegetables in layers (this allows the vegetables to keep their individual flavour so that you don't end up with veggie-mush), starting with harder vegetables like carrots and baby-marrow, and then working your way up from butternut and cauliflower, through to cabbage and potato pieces right at the end. Keeping the potato near the top of the stack is kinda important - otherwise you'll end up with mushy potato at the bottom of the pot. I'd be interested to know if any of our readers have ever tried cooking a vegetarian potjie. Please leave a comment if you have - I'd love to know what one can use as a substitute for meat at the bottom of the pot. Posted in General and tagged fire, food, tradition on Saturday, 25 April, 2009 by Paul.